This 10" tobacco hookah features 2 hoses, a glass base, a charcoal tray, and a ceramic bowl. It includes everything that you see as well as a set of tongs with a poker and a suitcase style carrying case. The base can be filled with water, wine, alcohol, or any other liquid to filter and cool the smoke. The base should be filled as high as possible without allowing the liquid to enter the hose when inhaling. 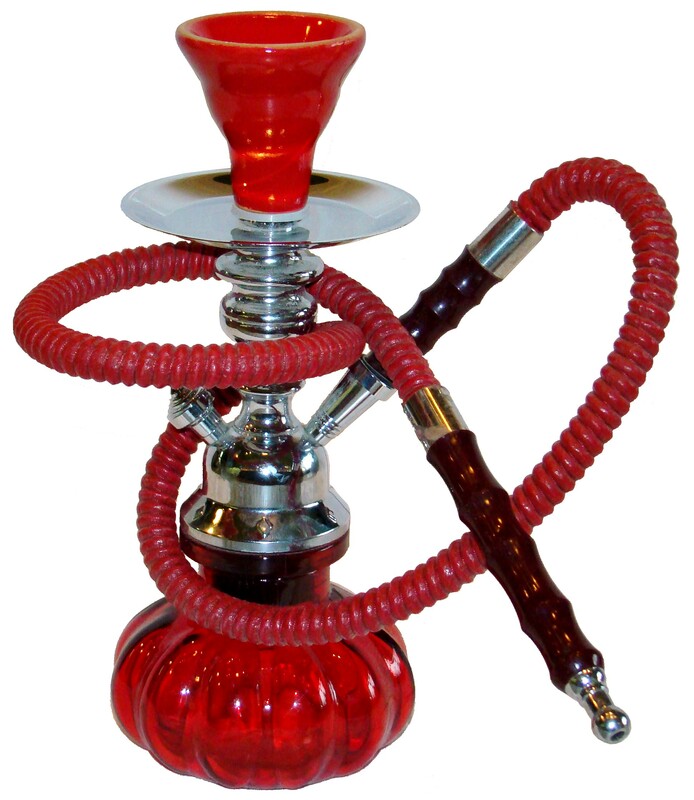 Please note that this is a very basic, entry level hookah that we purchase in bulk from various factories. As a result the colors, patterns, and even designs will vary. This hookah can be used to smoke cigarette tobacco, pipe tobacco, and/or shisha (generally a combination of tobacco, fruit, & honey). Cigarette/Pipe Tobacco Instructions: Fill the base as described above. Reassemble the hookah and place one or two of our 1" screens (available in brass but steel is recommended) in the bottom of the bowl. Fill the bowl as you would any other pipe, light, and then inhale through the hose. If the smoke sits in the hookah too long, just blow into the hose and it will expel the stale smoke through the breather opposite the hose. Shisha Instructions: Fill the base as described above. Reassemble the hookah, line the inside of the bowl with hookah foil (optional), and poke holes in the foil with the poker on your tongs. Next, fill the bowl with shisha and cover it with a hookah screen (recommended) or a layer of hookah foil. If you use foil, you will need to poke holes in the center 1" diameter of the foil. Using your tongs, hold and light a piece of charcoal. Gently blow on the charcoal for a few seconds and then place it on top of the screen or foil. Wait a couple of minutes and then begin inhaling through the hose. After a few puffs, the smoke should start coming easily. If the smoke sits in the hookah too long, just blow into the hose and it will expel the stale smoke through the breather opposite the hose. It sounds involved but once you've done it, it becomes second nature. It is important to note that you should only use hookah screens and/or hookah foil on your hookah. Household foil typically contains binding agents that are released when the charcoal heats the foil to high temperatures.